I took myself to the World Beer section at Tesco and was underwhelmed at the choice. Most people who know me know I have a ridiculous sweet tooth (I could eat cereal for breakfast, lunch and dinner). I spotted 3 flavoured beers, and I like flavoured beers. Done. 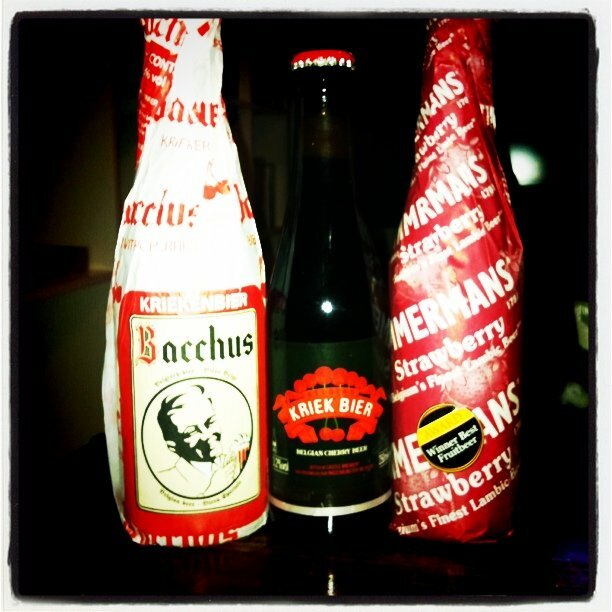 I picked Kriek Bier – a Tesco Finest selection, Timmermans Strawberry – I have fond memories of this one, and Bacchus Kriekenbier – fancy dancy packaging swayed me. The 3 have more in common than just being flavoured beers, they are all lambic or lambic style beers. Apparently lambic is a very specific type of beer, only brewed in a specific region of Belgium called Pajottenland. Unlike ale and lager which are fermented using the brewer’s chosen yeast, lambic beers are fermented spontaneously. During this fermentation process wild yeast is met with bacteria which results in a beer with a very distinctive flavour : Vinous, cidery, dry with a sour aftertaste. Flavours I ultimately picked up on during the tasting (which I was quite proud of). So, the tasting. Petite bottle (middle in the picture) which would usually be disappointing for volume purposes, but then again it only cost me 97 pence. Not much else to say about the branding actually – not ugly, not that impressive. Appearance: Dark red in colour with a lovely creamy head at first, unfortunately it didn’t last long. Nose: Instantly hit with the sickly sweet scent of maraschino cherries which overpowered any scent of beer. Despite my sweet tooth, the smell actually puts me off a little bit but I’m not one to back out of a challenge. Taste: Lovely notes of cinnamon and almond which goes well with the sticky sweet cherry flavour. After a couple of sips I definitely detected a slight smoky flavour. It is finished with the taste of sour cherries, not sour enough to balance out the sickly sweet taste you get at the beginning though. Not bad for the price but still way too sweet for my liking or to be drunk alone. To balance out the sweetness I would suggest drinking it with a meal of falafel, dried tomatoes, hummus and couscous. I started off on a bad note with this beer. By no means am I an eco-warrior but pointless packaging does quite annoy me. It is wrapped in a paper jacket despite having a detailed label on the bottle – a bit silly to be honest. Underneath the jacket is a lovely old-fashioned label which definitely fits in well with other Belgium beers and rightly so as it’s made there. It has a typical fruit beer AVB of 4.0% and is a lambic beer. Appearance: Dirty brown/red colour with a lovely long and luscious head of foam that holds. Taste: A very unexpected sour but obvious and distinct strawberry flavour. It tastes quite thick and after a few more sips becomes very malty. It is definitely a grower, as more strawberry hits you the more you drink. After drinking the Kriek Bier this does taste a lot less sweet but I’m not sure if this one is sweet enough. By the end though the strawberry taste is strong and I am satisfied. Despite being a fruit beer (which are usually considered to be very sweet – think fruli for example) – this beer is a more sour, understated and subtle addition. It would be suited best with a dessert – a chocolate torte or mousse would be perfect. I chose another cherry beer, this time made by the Van Honsebrouck family brewery in Belgium, known for creating typically Belgium style beers. At ABV 5.8% it is stronger than the usual fruit beer. This beer is again wrapped in fancy paper, however this time the bottle underneath holds no label and therefore the paper is not as much of a waste of time as with the last beer. Underneath the paper the beer is served in a lovely half champagne bottle. Appearance: Lovely delicate rouge red in colour with a lovely lingering foam top – appears to be highly carbonated. Nose: Mmmmmm lovely morello cherry with a hint of acidity, not too sweet or sour. Taste: Lovely lovely beer, much nicer than the first cherry beer. It has so much more depth in the flavour. First is that familiar dark/morello cherry taste, and then lovely undertones of brandy and almond – very very pleasant. Also hints of hops. My boyfriend says it reminds him of a cherry coke, I agree with him – it’s a grown-up cherry coke. I enjoyed this beer the most and was sad to drink the last drop. It’s perfectly balanced sweetness and variety of flavours makes it a very drinkable beer. I would enjoy this with a cheeseboard, breaded and baked brie would be wonderful. Lambic beers are a very popular type of Belgium beer and provide a distinct taste. However it is difficult to balance this distinct flavour with the right balance of sweetness. For me, the Bacchus Cherry was the best by a mile.